Being that Angie's List is an online paid service and also receives high traffic, the task of optimizing the landing page and join funnel is never "finished." Even the smallest adjustments can reap large rewards. I was given the opportunity to re-design these screens in late 2013, early 2014. Through a series of short A/B tests, the landing page was able to reap a 6% increase in memberships and the join funnel saw a 33% increase in conversions. While the original landing page (seen on far left) had been tested frequently over the years, it was in need of a visual overhaul. In order to give ourselves a better baseline for the re-design, I initially did more of an update to the original design (seen on close left), keeping the original color scheme & elements, but with a more pleasing layout. Once that design won, we moved on to the newer aesthetic (seen above) and tested from there to achieve the 6% bump in memberships. With this design, the successful content remained from the previous version, while a large focus on negative space was introduced to give that content the spotlight it deserved. The main value of the product was divided into digestible sections and a newer design aesthetic was applied. The previous join funnel (seen in the thumbnails below) was simply a lot to digest and users were falling off midway. It also needed better optimization for the growing audience of mobile users. 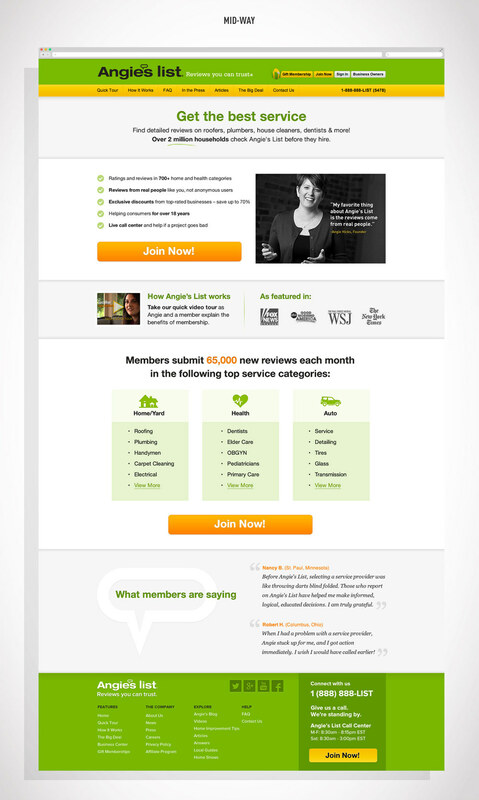 The redesign of the join funnel (seen above) focused on starting a conversation with users and really communicating both what you get from the membership and also what is happening in the moment (such as adding in the 'breadcrumbs' or confirming which plan was chosen). With the highly-responsive implementation of the new design, we were able to acquire a high number of mobile sign-ups and in the end, produced a 33% increase in memberships.